It's action, adventure and conspiracy on a cosmic scale in Hal Jordan and the Green Lantern Corps Vol. 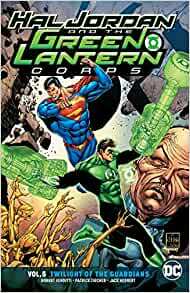 5: Twilight of the Guardians, as writer Robert Venditti (The Flash) and artists Patrick Zircher (Superman: Action Comics) and Jack Herbert (Superwoman) team up Hal Jordan with his greatest allies against his deadliest foes! The word is out: Sinestro has returned. Wherever this tyrannical former Lantern goes, hell is sure to follow. And when Hal Jordan travels to Earth to bring his former partner to justice, hell is exactly what he finds. Another of his oldest enemies is under attack from a surprising source, and he's unleashed all his powers to save his skin. If that means harnessing the evil entity called Parallax to corrupt the world's greatest hero, Superman, so be it. But an even greater threat than a mad Man of Steel awaits the Emerald Knight. From the darkest depths of the cosmos, the all-powerful Controllers have returned, threatening to settle their ancient grudge against the Guardians once and for all. It will take a strike force of Earth's first four Lanterns--Hal Jordan, John Stewart, Guy Gardner and Kyle Rayner--to save their old mentors and the universe. If the Lanterns fail, all of creation will pay the price. Collects Hal Jordan and the Green Lantern Corps #30-31 and #33-36. Venditti's fifth volume of Hal Jordan and the Green Lantern Corps sadly feels a bit too much like a place holder book while the series winds down to a close. With the final major arc of Venditti's run confirmed to be the return of the Darkstars (a rival group of space cops that jockey with the Green Lanterns for the position of policing the universe) this volume serves as the major set up for that later arc. To start, the book picks up the plot threads introduced in the recent Superman Action Comics Volume in which both Parallax and Sinestro returned. Hal and Supes briefly team up on Earth in order to investigate Sinestro's return before running across Hal's other old foe Hector Hammond. Hammond is about to be kidnapped by aliens hoping to harvest his immense psychic powers and only his old enemy can save the day. The first arc is short but strong as it serves as a tragic look at the bulbous-headed psychic and how desperate he has become with his condition. The second arc of the book serves as the reintroduction of the Controllers: the ancient enemies of the Guardians of the Universe who sprang from the same original race as the blue dwarves. Unlike the Guardians, the Controllers seek to dominate the universe to their will and hope to convert the final surviving Guardians (Ganthet, Sayd, and the remaining Templar Guardians) into their own species. The arc is decent, but short lived as the four Earthling Green Lanterns quickly (almost too quickly) locate the Controllers' base and rescue the Guardians. While the story ponders the place of the Guardians in the new Green Lantern series to interesting effect (as well as raising questions over whether or not there is any hope for them to propagate their species) the story mainly just resets the status quo of the GL Corps: the Templars are returned to the fold and the reunited Guardians resume their ceremonial place leading the Corps. Meanwhile, the Controllers have increased their numbers by a few and announce their intention to revive the Darkstars. All in all, a fun read (thanks to the great handle Venditti has on these characters), but a light volume overall due to the continued breaking down of recent Green Lantern history to resume the status quo (just as the previous volume unceremoniously put an end to the fledgling Green Lantern/Sinestro Corp alliance). I was going to wait for this to drop in price a bit before I bought it, as I usually get Trades when they drop to 10, but I immediately bought it at 15 just because I saw a negative review and I gotta represent my boys Hal, Guy, John, and Kyle. Although I have to say that if I could give Green Lantern(s) 6 stars then I would, because that series showcases what it’s like to live with courage as an everyday person in a way that the (also terrific) antics of the aforementioned GLs haven’t touched on since I’ve been reading. I read every Rebirth series in Trade format eventually but I always read the new GL releases as soon as I get them, a practice I only mimic with Batman (a character I’ve been fond of for my entire life). The visuals, fleshed-out characters, and overall inspirational message encapsulates everything comics should be. The GL Corps are heroes driven entirely by their inner fortitude and their enemies are the embodiments of fear, rage, and greed. Not since Star Wars has such an internal struggle been displayed in such a fascinating way. Tl;Dr Green Lantern rules and only the blue pill of Hope can heal the red pill of Rage. 5.0 out of 5 starsGreat Storyline! Another great volume from this series. I don't even bother reading the actual Green Lantern Series because this one is so good. Both story,and art were average. 4.0 out of 5 starsLove gl. 5.0 out of 5 starsFast and prompt! I had this pre-ordered, but I cancelled it because D.C. chose Zoe Quinn over me. I won't pay them to hate me. I've been spending well over $1,000 per year just on D.C. books, and now it's $0.00 per year.